Light bulbs that use LED technology not only bring down your energy bills but are also more environmentally friendly when compared to incandescent bulbs and compact fluorescent lights (CFLs). Both the manufacture and use of LED bulbs causes less damage to the environment than the other two alternatives. For starters, a 6-to-8-watt LED bulb, with a light output of 800 lumens, will last for 50,000 hours. In comparison, incandescent bulbs last 1,200 hours and consume 60 watts, while CFLs last for 8,000 hours and use 13-15 watts. LED bulbs consume less power per unit (lumen) of light emitted. This reduces greenhouse emissions from power plants. Carbon dioxide emissions for LEDs are also low. Roughly, one LED bulb will minimize greenhouse gas emissions by almost half a ton. The annual energy consumption for an LED bulb is around 30 times lower than for a corresponding incandescent bulb. 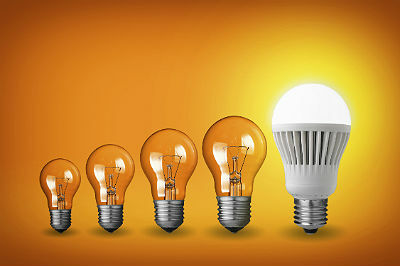 According to the U.S. Department of Energy, lighting accounts for a fifth of the energy consumption in a U.S household. LED lights can bring lighting costs to 5 percent of the total electricity consumption in homes. LEDs generate less heat during use and hence associated cooling costs are comparatively lower. Incandescent bulbs release 90 percent of the energy as heat. While LED lamps lose around 5 percent of the energy generated to heat, the rest is converted to light. It's clear that LEDs are a big advantage over incandescent bulbs, but what about when compared to CFLs? The biggest difference is that LED lights and incandescent bulbs do not contain hazardous mercury, while CFLs do. But with respect to disposal, the negative impact of LEDs on the environment exceeds that of CFLs. It's an anomaly that researchers are confident about righting in the coming four to five years. The large aluminum heat sinks used in LEDs are expected to give way to smaller ones, and possibly other more energy-efficient alternatives. Efficient aluminum recycling will further lessen the environmental impact of LEDs during the disposal phase of their life cycle. At present, LED lamps using 80 percent post-industrial recycled aluminum for the heat sinks are available. The energy-saving potential of LED bulbs can be assessed from the fact that in 2012 around 49 million LEDs were installed in the U.S., and these accounted for savings of around $675 million in one year. By 2030, 3 out of 4 light bulbs will be using LED technology. This will reduce carbon emissions by 1,800 million metric tons. And could cut the demand for electricity by one-third. The adoption will preclude the construction of 40 new power plants in America. The environmental benefits are easy to understand. Such a scenario reduces our dependence on nonrenewable sources of energy and the environmental degradation that accompanies mining for coal and drilling for oil. The two biggest environmental advantages of LED accrue from its low energy consumption and long life. As compared to CFLs and incandescent lamps, fewer LED lamps need to be produced, packaged, transported, used and ultimately disposed. At present, the biggest hindrance to the adoption of this green lighting technology is the initial installation cost. LED bulbs are more expensive than other alternatives, but an LED lamp that lasts for 10 years repays its cost in five years. Piyush Bakshi holds a bachelor's degree in textiles engineering. An enthusiastic learner about the events that are shaping our times, Piyush has more than a decade's experience in writing on various niches, with a particular interest in healthcare, environment and distribution and warehousing.